You can send several files for us to merge. The best working format file is PDF format. Tell us the order of the files, if you want to insert blank pages, whether to number the pages or any other information if necessary. Following your instructions about the work we create a single PDF document. 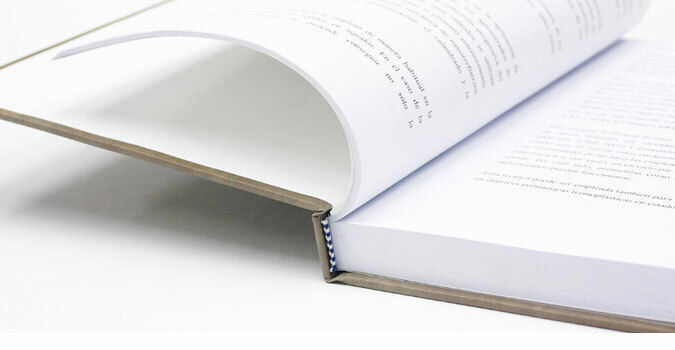 Once you have checked and give us the go-ahead, we begin printing your thesis, dissertation or final degree project. In ThesisBindingHouse.com only pay for the coluor pages you print in colour. Our digital printing machines differenciates between colour pages and black and white pages.Our printing rates in both cases,black and white and colour, are the most competitive for printing your thesis, dissertation and final degree project. Our digital printing systems has black and white grayscale printing with continuous gradation, ensuring an excellent result. And color printing with a print resolution of 1,200 (3.600 equivalents) x 1,200 dpi which ensures a perfect finish on all images and graphics printing your project or thesis. We only use high quality paper to print your thesis or dissertation. Papers of 100 grams and high whiteness, offset or satin as required. But we also care about the environment so we only use FSC certified papers / PEFC responsibly managed forests, bleached paper totally chlorine free (TCF) or 100% recycled paper. For the highest print quality of your project, the files should have a resolution of at least 200 dpi. Printing documents with lower resolution may result in pixelated text and images. Plain colors in backgrounds and masses of colour have to always be in CMYK mode. Digital printing gives a higher quality if it has not to be converted to CMYK colour system from other systems. When preparing a file to print, the document size should be 2 mm. more on each side with respect to the actual document size.